S M Ong: Might as well walk: If e-scooters have a speed limit, why not joggers too? Might as well walk: If e-scooters have a speed limit, why not joggers too? They are the new public enemy No. 1. No, I’m not talking about plastic straws. Or smokers who are afraid they may soon not be allowed to have a puff in their own home. Smokers are the old public enemy No. 1. The new public enemy No. 1 is the e-scooter. Not only have e-scooters sent people to hospital (and I don’t mean transporting them there), but they also have batteries that can catch fire and barbecue your home. Hence, all the new safety regulations. Then last week, I saw a comment on Facebook that offended me so much that it was all I could do not to make a police report. Someone was commenting on a Straits Times video about the new law reducing the e-scooter speed limit from 15kmh to 10kmh on footpaths. As a runner (not the loanshark kind), I was triggered. In the first place, if your speed is more than 10kmh, you’re no longer “jogging”. You’re running, baby. And you know why there are no laws restricting “jogging speed”? Because a runner didn’t collide with a 45-year-old woman in Bedok Reservoir Road in March, leaving her with severe head injuries. Because a runner didn’t collide with a 56-year-old woman in Yishun nine days later, leaving her with a lower lip laceration, chest wall strain and skin abrasions. Because a runner didn’t collide with a 65-year-old woman in an Ang Mo Kio HDB block lift lobby in April, leaving her with a cut on her nose and bruises on her hip and leg. Because a runner didn’t collide with a five-year-old girl outside Sembawang MRT station in May, leaving her with abrasions on her limbs and a bruise on her forehead. Because a runner didn’t collide with a nine-year-old boy in Clementi in July last year, leaving him with abrasions on his right elbow, wrist and left knee. Because a runner didn’t collide with a 61-year-old woman in a Yishun hawker centre last October, knocking her unconscious. Because a runner didn’t collide with a 55-year-old woman at a Pasir Ris bus stop last September, leaving her with severe brain injuries and in a month-long coma. You know who did all that colliding and injuring? The people who won’t be allowed to go over 10kmh on footpaths next year. Some e-scooter riders have complained that at that speed, they might as well walk. You know what? That’s not a bad idea. Walking is good exercise and you have less chance of burning down your home or knocking someone unconscious. It’s cheaper too. Practically free. And if you can walk 10km in one hour or even 5km in half an hour, hats off to you, although technically speaking, you’re not walking but running, as I’ve established earlier. But if you can’t pass your IPPT, even 2.4km in 15 minutes will be hard. You might as well ride an e-scooter even with the new speed limit. E-scooter fans should be thankful their favourite two-wheel hazard hasn’t been banned outright – yet. An online petition started by a Mr Rodney Tan called “It Is Time to Ban E-Scooter in Singapore” has already surpassed its goal of 1,000 signatures. “I have seen, and can safely say many others too, that these e-scooterists would utilise both pedestrian walk paths and road meant for vehicles, whenever they feel it was convenient. “As a motorist, I really do not know what to expect of them in terms of road practices. Oooh, and he managed to throw in a little shade at cyclists too, just to let them know that even though e-scooter riders have overtaken cyclists as the No. 1 road nuisance, they haven’t been forgotten (although losing their deposit to oBike should be punishment enough). Unfortunately, the petition was started at least two years ago. We've now gone way past the bud stage. And judging by the number of e-scooter collisions since 2016, it has indeed got out of hand. But instead of a ban that Mr Tan wants, the Government seems to be just making it as onerous as possible to ride an e-scooter. We can see how effective that strategy has been with smokers. Old habits die hard. 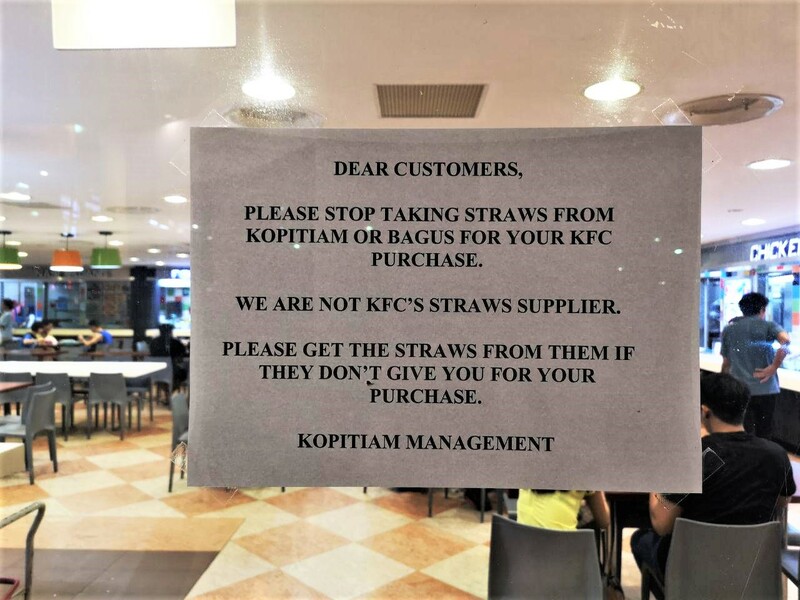 Now please excuse me while I jog at less than 10kmh to Kopitiam to get a straw for my KFC drink.